This is what your query should show - see notes below. Using ISNULL Use the IsNull function to substitute the words No summary for rows where the Summary column is null. Using COALESCE Do the same thing, but using the COALESCE function instead. Using CASE Use a CASE WHEN statement to show different things according to whether the Summary column is null or not. Take a moment to think which method you liked best, then save your query as Missing summaries and close it down. 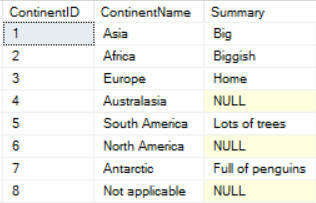 The WorldEvents database table dbo.tblContinent that I downloaded doesn't have a third column. Is that the case for others? You're right! I've updated the download file, and it should now be fine. Thanks.